My Shadow Strider costume was quite the challenge. I found the idea in a Youtube video (though in the video they call it a stilt spirit… I thought it needed a better name). Starting in May, my step-dad and I built circus peg stilts, which I sewed foam around. I then covered the foam in strips of black cloth. That was for the back legs. 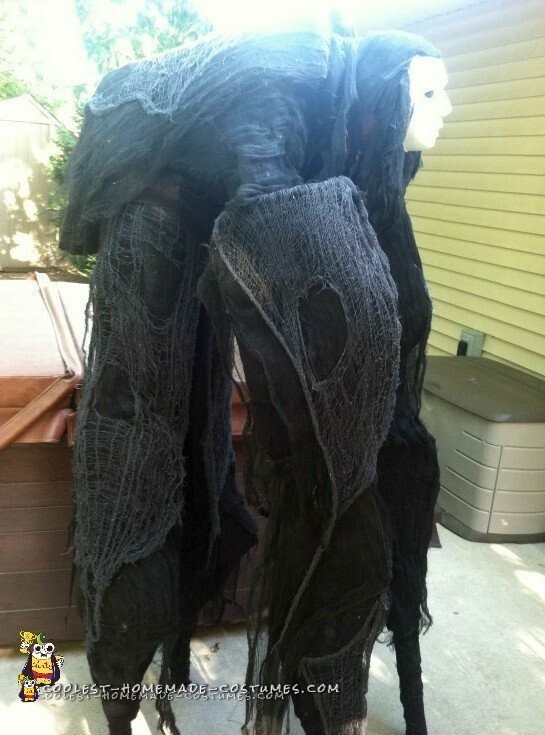 For the front legs, I sewed foam around aluminum stilts, and covered the foam in strips of black cloth. For the hump (the back) we sewed foam onto a black jacket and covered it in strips of black cloth. Then, we covered everything in creepy cloth. For the mask, we took a white mask and hot glued creepy cloth on it. I took the costume to Gen Con and got some great reactions. Many people were startled by my appearance. Many people thought that I was a boy, since my face was covered. All in all, a great turn out! Homemade costume idea posted by Kendalyn J.